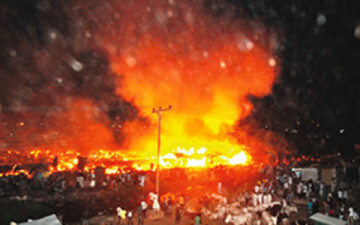 An estimate of about 5000 people loosed their homes and properties due to a fire outbreak in Kara Isheri Area, Ogun State. Properties worth millions of Naira was destroyed. A wooden room was caught by the fire and it spread through a room where some people fuels stored in containers. A supplier of water and drinks, Kola Akanmu lost all his source of livelihood which also includes a sum of N100,000 cash. He explained that it was difficult to bring down the fire and if he had known he would have evacuated his goods before the fire got out of control. Two other individuals also lost their source of income as a result of the inferno.